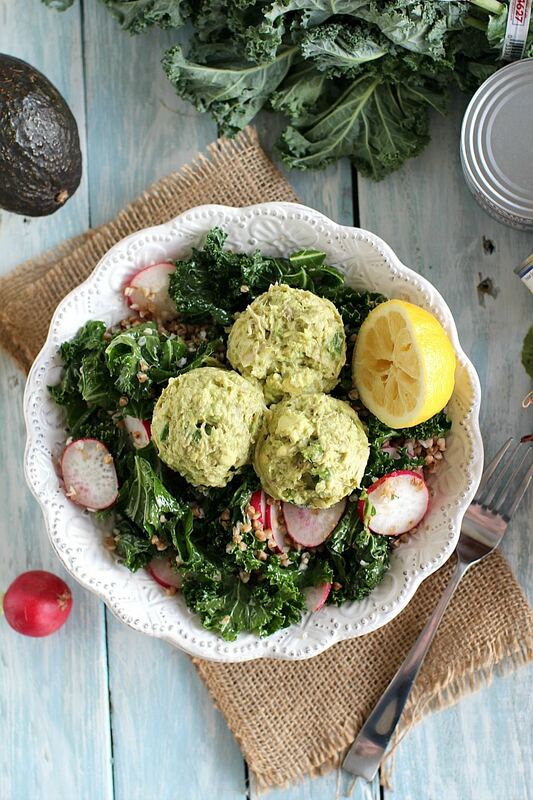 Avocado Tuna Salad is served over toasted buckwheat and kale, with crunchy radishes. It is nutritious, fresh and hearty with a spicy kick. Avocado Tuna Salad is a a quick and delicious salad made easily at home. I used white albacore in water as the main protein in this dish. Then, I mixed it with a ripe avocado, lemon juice and chopped jalapeno for a spicier kick. 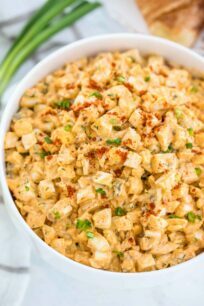 Just look at those tuna salad scoops, you can see huge chunks of tuna, and this is what I love about it: the firm texture, light color and fresh taste. 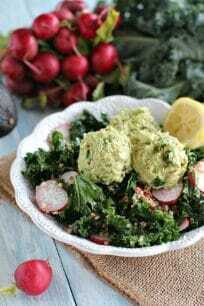 I served the Avocado Tuna Salad over a bed of kale mixed with buckwheat. In addition, I added some sliced radishes for a pop of color and some crunchiness. This salad is perfect and I like how quickly it comes together. Also being super filling, nutritious and delicious. To save time during the week, I usually cook some buckwheat during the weekend and store it in an airtight container in the fridge. I add it to salads or use it instead of rice. For the perfect kale texture, I massage the kale with some lemon juice and olive oil, so its soft and tender. Also, if you want to add more proteins to the salad, add some extra beans. 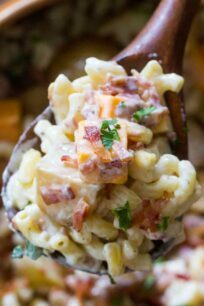 In addition, you can substitute tuna with chicken or bacon, or other meats if wanted. Bring a kettle of water to a boil. Place buckwheat in a rice colander and wash, drain excess water. 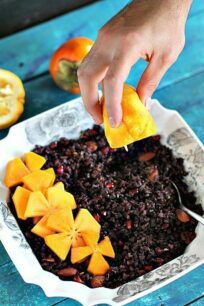 Add buckwheat to a medium bowl, pour 1 cup of hot water over it and cover with a towel or dish. Let it stand for 30 minutes, drain any excess water, add half to a salad dish or transfer to a container if not using immediately. Remove stems from kale leaves and discard. Chop kale and add it to a medium bowl. Mix with olive oil, one teaspoon of lemon juice and dash of salt, massage the leaves with your hands for one minute and add to the bowl with buckwheat, add sliced radishes and give it a stir. In a small bowl mash the avocado, add tuna, jalapeño, one teaspoon of lemon juice and dash of salt. Mix until well combined and scoop on top of the salad. This mixture is also great in sandwiches or wraps. This is insanely creative! Love the idea of putting avocado in tuna salad! Love the addition of avocado in the tuna salad! I’ve got to make this for my mother-in-law – she’d go nuts for it! Loving this spicy take on tuna salad! Sounds so good! Love that you spiced things up with some jalapeño! Love this twist on a traditional tuna salad – can’t wait to give it a try! What a delicious twist on tuna! I love the spice!